Pudong-based enterprises have made a breakthrough and acquired protection from Shanghai Customs for their intellectual property assets. Containers line up at the busy China (Shanghai) Free Trade Zone in Lingang. Shanghai Customs has beefed up measures to better protect the intellectual property assets for local enterprises. 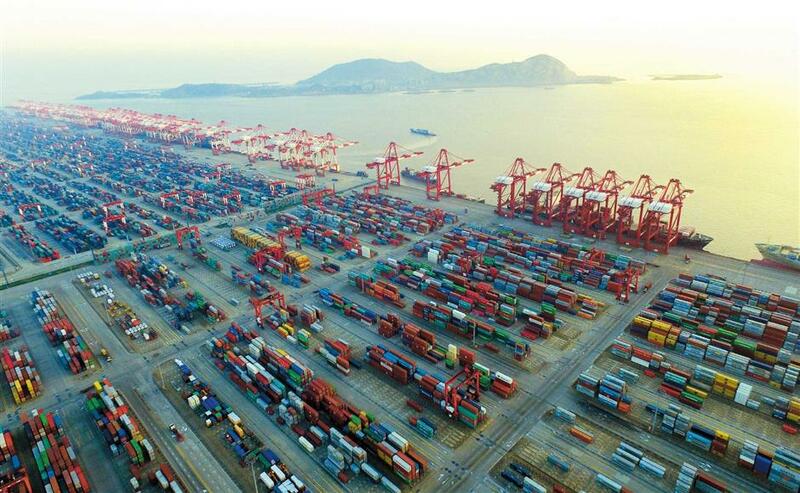 Pudong-based enterprises have made a breakthrough and acquired protection from Shanghai Customs for their intellectual property assets after a rigorous strategy to do business overseas. The three-month campaign ensured enterprises can now safeguard their intellectual property rights over traditional export products with comparative advantages, such as: Home appliances, consumer electronics, engineering machinery and several other featured items. Customs sent officers to several key enterprises for intellectual property law enforcement coordination to work with intellectual property law enforcement staff to launch a crackdown on offenses against intellectual property. The Shanggong Shenbei (Group) Co, on Luoshan Road, is the parent of Shanghai Shanggong Butterfly Sewing Machine Co and owns brands “Shanggong” and “Butterfly” which are often counterfeited by industry peers. Shanghai Customs carried out surveillance protection on products with high risks of being counterfeited and seized 100 fake “Butterfly” sewing machines exported by a trade firm in Ningbo City. As a consequence, an offender was discovered and eventually found guilty by the No.3 Intermediate People’s Court of Shanghai last September. Shanghai's first intellectual property protection center was established in July, in Zhangjiang Hi-tech Park, to shorten the patent application process and enhance protection. The China (Pudong) Intellectual Property Rights Protection Center helps to halve the application process by 15 months. Previously, applications had to be lodged with the State Intellectual Property Office in Beijing, a process which could take up to two-and-a-half-years. The center hires an expert panel to evaluate and help improve the patents before submitting them to the national office. Those submitted through the Pudong center will also enjoy a faster “green channel” in Beijing. The service will expand later. The two pillar industries of Pudong generated more than 140 billion yuan (US$21.42 billion) in production value in 2016, and more than 6,500 approved patents. Most came from leading companies, such as: Commercial Aircraft Corporation of China (COMAC), MicroPort Scientific Corporation and Semiconductor Manufacturing International (Shanghai) Corp.
Pudong is home to burgeoning high-end equipment manufacturing and bio-pharmaceutical industries, where demand for intellectual property rights service is high. In the last year, Pudong enterprises filed more than 9,500 patent applications in high-end equipment manufacturing industry with 2,300 coming from the biopharmaceutical industry. A complaint channel and a range of mechanisms will be established by the center to protect intellectual property rights, including: Fast response mechanism of complaints, a multiplex mechanism of disputes solution, and an online rights protection mechanism of competitive industries. In addition, the center will initiate coordinated and cooperative actions to protect intellectual property rights in all industries. They will investigate and penalize illegal practices on patent, trademark and copyright. They will also carry out special law enforcement operations, and promote fast response to infringement of IPR in key fields, areas and markets. The center will also work with the Shanghai intellectual property court (the No.3 Intermediate People’s Court of Shanghai) to enhance the protection. patent, trademark and copyright services into one. Pudong has stepped up the protection of intellectual property rights since it opened China's first independent intellectual property bureau to handle disputes over trademarks, patents and copyrights. Unlike other places in China where intellectual property rights disputes are handled by different departments with poor efficiency, the Pudong Intellectual Property Bureau is the merger of three departments for separate protection of trademarks, patents and copyrights. Shanghai Upper Biotech Pharma Co Ltd, for instance, bought a global IP composite insurance from Cathay Insurance last November. The deal was brokered by the bureau which promotes intellectual property insurance to potential buyers. The bureau also set up an intellectual property rights service platform in Shanghai Pilot Free Trade Zone to encourage innovation and establish long-term cooperation with the Walt Disney Company to solve intellectual property rights complaints. Last year it confiscated 727 pirated Disney products. Pudong also devised an intellectual property rights dispute settlement system involving government mediation, judicial mediation and third-party mediation. Last year, the bureau resolved 57 dispute cases through third-party mediation. In the first 11 months of 2016, Pudong generated more than 26,000 patent applications, up 33.2 percent from the same period of last year. Moreover, an intellectual property tribunal was set up in Shanghai Pilot Free Trade Zone in April 2015. The intellectual property tribunal is administrated by Shanghai Pudong New Area People's Court to meet the increasing demand for intellectual property protection in the zone. An intellectual property rights judicial protection liaison office of the Supreme People's Court of China (SPC) was unveiled in the zone at the same time. With the liaison office, emerging or complex issues concerning intellectual property rights cases of the zone are more efficiently communicated to the SPC.